The Toyota Etios is a tragic hero. So is its hatchback version, the Etios Liva. Launched in 2010 and 2011, respectively, these two cars had most things Indian customers wantedfrugal engines, roomy cabin, low sticker price, class-leading featuresyet they didnt really click with the masses. One, the competition kept on improving. Two, the design of the Etios range didnt break new ground. And three, customers often complained that these cars NVH levels were high and refinement levels low. This week, Toyota added a third sibling to the family, the Etios Cross. Underpinning the Liva platform, as mentioned earlier, it is more bold, tough and robust in character. As for the front facade, it sports a lurid front grille which is protected by a silver colored grille guard. Dual front fog lamps with integrated turn indicators enhance the appearance of this crossover. The company’s logo finds its place in the centre of the radiator grille. Etios Cross shares its headlamp cluster with the Liva hatchback and beneath it, there is a wide air-dam. In addition, the body colored door handles and body colored outside rear view mirrors with turn indicators are a symbol of lavishness. As we go sideways, there is a silver colored cladding and wheel arch fenders. The 15′ diamond cut alloy wheels are flamboyant and make the crossover much sportier. The sturdy silver colored roof-rails seem upbeat at their place and compliment well the sportiness of the crossover. Going by the rear end, it is again identical to the younger sibling, Liva hatchback, but multiple additions in form of black colored bumper, silver color cladding make it more exotic. Additionally, several features such as the rear windscreen comprising of wiper, washer and defogger, dynamic garnish with badging, roof spoiler, roof-mounted Antenna etc. justify the sporty character of the crossover. The company has offered the compact crossover with a total of 8 dynamic colors – Inferno Orange, Ultramarine Blue, Classic Grey, Harmony Beige, Celestial Black, Vermilion Red, Symphony Silver, and White. Etios Cross interiors are done in a plush piano black theme, matching to the door arm-rests. The sporty seats are done in fabric with stitch while the front seats also displaying the ‘Etios Cross’ badging. Although, the wheelbase is lesser than that of Etios sedan but despite that it comfortably accommodates five people with ample spaciousness and adequate knee room. The ergonomic seats with an added functionality of adjustable front and rear headrests enhance the comfort during long journeys. Also, the height adjustable driver’s seat proves to be handy during such voyages. There is a boot space of 251 litres which swallows a decent amount of luggage. As for infotainment, the compact crossover flaunts a 2-DIN Audio CD System with USB, Aux-in and Bluetooth connectivity. The Audio system comes remote controlled with 4 speakers whereas additional operating switches are also installed on the leather wrapped 3-spoke power steering wheel. Above the audio system, there is A/C with heater and clean air filter in order to ensure dirt-free and hygienic atmosphere inside the cabin. The crossover also has a cooled glove-box which can store up to 13 litres. Also, there is an array of comfort and convenience features like Power windows with driver side auto down, front cabin lights and 12V power outlet, 7 bottle holders, front and rear door pockets, chrome accented A/C vents, Digital clock, Assist grip with coat hook etc. that continue to serve effortlessly and keep the human efforts minimum. The Etios Cross, with all the three engines, delivers supreme fuel economy. The 1.2L petrol motor which serves the base variant of petrol line up returns a mileage of 17.71kmpl which is decent in accordance with the Indian roads and traffic. The heavier petrol engine of 1.5L, despite being performance oriented, pulls out a fuel efficiency of 16.78kmpl which is commendable. The diesel mill, being mileage eccentric, registers the best fuel economy and delivers a thumping 23.59kmpl which is at par comparing with some of the other vehicles in the segment. Toyota Etios Cross handling is a bit off mark at high speeds but it is decent in city driving, courtesy the 3-spoke leather wrapped electric power steering with tilt function. The audio controls find a place on it too, so that the driver can comfortably set the volume according to his desire. As for performance, the company hasn’t tweaked or tinkered the all three engines; so it is a good performer spontaneously. The 1.5L petrol engine propels the crossover touch the 100kmph mark from standstill in a mere 11 seconds while clocking 160kmph as top speed. The other petrol engine, the 1.2L, achieves the 0-100kmph in a comparatively larger time span due to less powerful and mileage oriented. Precisely, it touches the 100kmph from standstill in 14 seconds along with a top speed of 150kmph. The 1.4L diesel mill focuses more on fuel efficiency and hence, lacks behind the petrol models by a fair margin. It crosses 100kmph barrier from standstill in 18 seconds and measuring top speed as 160kmph. The Toyota Etios Cross comes with dual front airbags as standard on all variants. Except for the base G version, all other variants have ABS. The Etios Cross also scored an impressive four out of five stars in the Global NCAP safety rating, making it one of the safest crossover hatchbacks in the country. The Etios Cross comes with good road manners. Comes with 2 airbags and ABS+EBD and rear defoggers. Toyota Etios Cross doesn’t seem to be a crossover; in fact, it’s the Liva with added features and better interiors. Well, such models haven’t worked out in India before too, going by the dismal performance of Skoda Fabia Scout and Volkswagen Cross Polo. 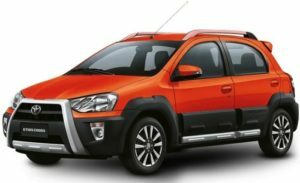 Overseeing it, Toyota Kirloskar Motors (KTM) has played a big gamble in the form of Etios Cross and in order to justify its step and receive optimum response, the company needs to market it aggressively. The price is also bit off, seeing the features available.